Are You Focused On The Wrong Objectives? Before you say, sales, sales, sales, understand that every company is in business to create sales that yield profits. To this end, you need to focus on the right business goals. Sales by themselves aren’t enough to generate profits. Your top line can keep increasing but if your costs are so high that you loose money with every sale, you’ll eventually go out of business. Back in its early days in the mid to late 1990s, Amazon sold books at 50% off their cover price. At the time, book margins were 45-50%; this was the amount that book retailers paid to purchase the books. I know this because at the time I competed with Amazon. I ran 6 book clubs for the US division of Bertelsmann, known as Bookspan. Once you add the cost of marketing, shipping and operations to the cost of the books Amazon sold, the firm had little or no money left to cover other costs, let alone contribute to profits. Amazon built its housefile of customers to grow their business. In the process, it collected a lot of information about them and their purchase behavior. Amazon developed customer loyalty that’s become the core of their business. They’re the only ecommerce site that still requires customers to sign in before purchasing. As a result, Amazon can send prospects appropriate messaging if they leave products in their shopping basket. While you probably can’t shake Amazon from their dominant online commerce position, you can learn how to improve your business. Like Amazon, your firm must focus on 3 key business goals to build your base of profitable customers. These are members of your target market who have never purchased from your company before. Understand that if you only focus on acquiring new customers, you’ll have a very high churn rate, the number of customers who leave as a percentage of your total customer base. Also, you won’t have the opportunity to recoup the money you invested in acquiring the buyer in the first place. Examine who is purchasing from your competitors and near substitutes. Take your blinders off and consider both direct competitors and broader based competitors. One of the biggest mistakes I find marketers make is thinking very specifically when they assess competitors. Many marketers are on a hamster wheel; they continue to attract and convert new customers without trying to mine their current buyers for additional sales. Yet retention sales are more profitable since you don’t need to pay for media and advertising to promote them, that’s a sunk cost that you’ve already absorbed. Encourage additional purchasing with the first sale. When customers checkout, offer them related or additional products. This is easiest to do when you’ve got a coordinated product database. If you don’t have a database, just offer customers your most popular product – not your most expensive one!!! Provide a good customer experience. Roughly 20% of customers leave and NEVER return due to a poor customer interaction. Include another offer with the purchase receipt. Customers are most excited about your company when they first purchase. Take advantage of this. Provide relevant information to improve purchase use and make them a related offer. Ask for reviews and social shares. Create a series of relevant, non-promotional information. 64% of customers want to be contacted via email or text. Based on purchases and marketing personae, offer regular targeted content. Use email with links to your products. Send regular content. Don’t be a nag. Send on-going promotions on a schedule that correlates with your editorial and promotional calendars. Be careful not to over mail your customers and prospects. Skip the overt promotion. Remember that today’s savvy customer doesn’t want to be sold. Getting a former customer to buy from your company again creates a second lifetime value. Therefore you can make them an offer to purchase again. Find out why customers stop buying from you. Where possible get additional feedback as to the specific reason an existing customer is leaving. While they may not be forth coming about the reason, try to incorporate this question into your customer service and sales processes. Assess your customer file on a regular basis to determine when customers have stopped purchasing from your company. Don’t just arbitrarily decide. Instead re-market them after they haven’t purchased in a specific timeframe that’s related to your product usage cycle. Send past customers a special offer to start purchasing from your firm again. It’s a good idea to make a few regular promotions before you try a winback offer. The bottom line is that customers are your firm’s lifeblood. You need people to keep purchasing from your organization or you’ll go out of business. Therefore, the ONLY 3 business goals your company ever needs focus on your customer base. You need to acquire new customers, get your current customers to buy more or related products, and reacquire former customers. What do you do to keep your customers purchasing from your firm? Tags Business Goal. Bookmark the permalink. 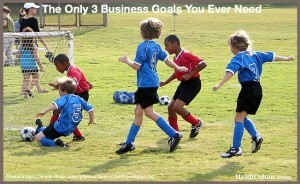 Hello Heidi, this is a great streamlined view of setting marketing goals. I have to agree that these days the customer has to be at the centre of everything! Switching to a customer-centric approach is key nowadays. Too many people focus on numbers in the short-term, as opposed to how they can grow their business through honesty and integrity in the long run. Also, a lot of customer service tends to be poorly monitored, with many representatives getting defensive or not caring about the customer’s needs. You’re absolutely right when you recommend retaining and reacquiring old customers. Listening to their needs is key!